People think water is water; H2O and all that. In fact, water is much more than three molecules, and pure water does not exist in nature. Water is a product of location, and no two sources are alike. They are all susceptible to what kind of air precipitation falls through, the landscape where they reside in or flow through, and what gets added to them. Breweries historically were built where there was a good source of clean groundwater. That’s not as easy as it sounds, since as soon as man settled down to start farming or build settlements, they immediately began to misuse their closest water source; ironic, in that it was usually the reason they picked the location in the first place. So breweries needed to find clean wells or running water that was unaffected by humans. All fresh water has multiple minerals, and it is these elements, unknown until just over hundred years ago, which influenced what styles of beer emanated from any location. The main elements are called ions, and they have either positive (cations) or negative (anions) charges. The pH of the water is the concentration of hydrogen ions. Neutral water has a pH of 7, and an equal concentration of hydrogen (H+) and hydroxide (OH-) ions. Lower pH value waters have a higher hydrogen concentration and are more acidic, while higher pH values have a higher hydroxide concentration and are more alkaline. The best brewing waters are slightly acidic, with a pH range of 5-7. 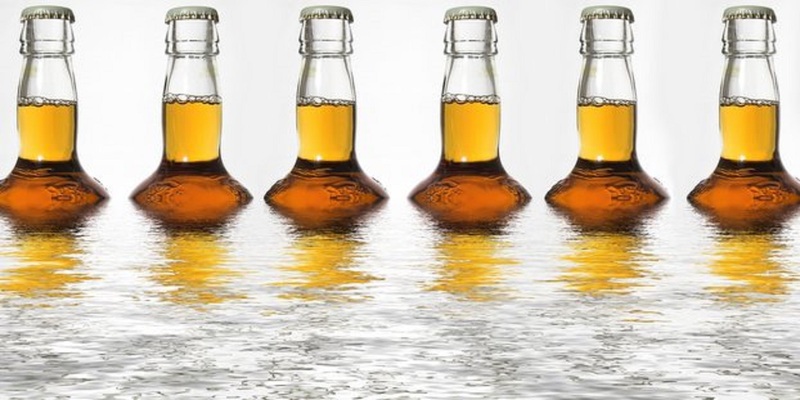 Brewing water influences beer in three ways. The first is its effect on the pH of the beer, which is reflected in the beer’s flavour and mouthfeel. 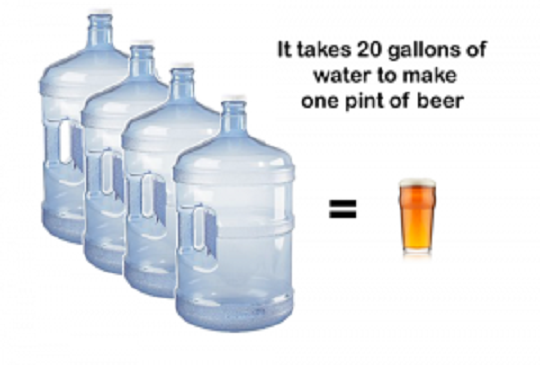 Secondly, the sulfate-to-chloride ratio determines what type of beer works best with a particular water. Higher sulfate concentrations emphasize hop bitterness and sharper beer styles, while higher chloride concentrations accentuate the malt character. Cities with balanced ratios can produce a large variety of beer styles. Lastly, water can cause off-flavours if it contains unwanted minerals or impurities. While there are multiple ions in water, the main six that carry the most influence for brewing are bicarbonate, chloride, and sulfate representing the anions, and the most important cations are calcium, sodium and magnesium. Each plays a part in the brewing process. Bicarbonate (HCO3) is the primary anion in the wort and determines the alkalinity of the brewing water. It also helps neutralize the acids present in dark and roasted malts, and aids in extracting colours from the malts. Calcium (Ca2+) is essential in reducing the mash pH to an acceptable level, lowers the extraction of tannins, and assists in protein coagulation. It also assists in the clarity and stability of the beer. Magnesium (Mg) is useful as a nutrient for the yeast, but only in small amounts (10-20 ppm), so as not to give too harsh a taste to the beer. When the phytin in the malt degrades in the mash into phytic acid, calcium and magnesium phosphates will also form, which adjusts the pH. Calcium and magnesium determine the water’s hardness. Bicarbonate reacts with calcium to reduce the water’s hardness. Sodium (Na) can help accentuate sweetness if present in low concentrations, but it adds too much salty or metallic flavour if at higher levels. It contributes to the body and mouthfeel of the beer. At higher concentrations, sulfate will help emphasize the bitterness of the hops, as found in the water at Burton upon Trent, England, a home for the British IPA. The water here is also exceptionally hard, with high concentrations of magnesium as well, which also accentuates the dryness in pale ales and bitters. It also lowers the water’s pH. Chloride (Cl−) is an anion which can enhance fullness and sweetness, but only in low concentrations, because too much will affect how the yeast settles out after fermentation (flocculation). It also influences the mouthfeel and complexity of the beer. These minerals have all had a part in which beer styles were developed where. The higher concentration of bicarbonate in the waters of Dublin, London, and Munich helps balance the acidic qualities of the dark and roasted malts used in the brewing of stouts, porters and bocks. Pilsen, in the Czech Republic, has very low concentration of all ions, as low as any place on earth. This water is great for pale malts, and its low minerality makes the local pilsners unique in the world. It is impossible the recreate their recipe in other locations, without altering the water significantly. Brewing techniques have also been adopted worldwide to compensate for the lack or overabundance of minerals in the water. Decoction mashing arose to compensate for low mineral waters by its use of multiple temperature rises. 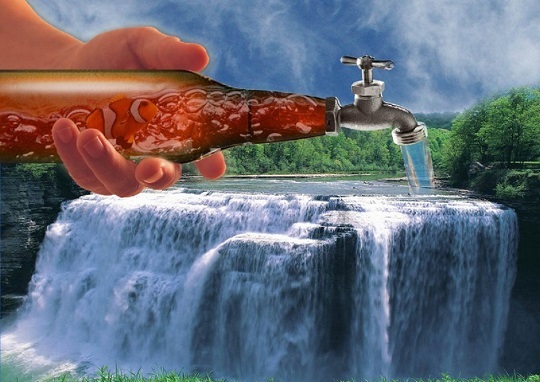 Of course, modern breweries can now alter their local water source into any concentration of minerals they want. The addition of various salts is often called Burtonizing, whereupon the addition of gypsum and Epsom salts raises the hardness and sulfate concentrations of the water to the levels evident at Burton upon Trent. Calcium carbonate, calcium chloride, and even non-iodized table salt can also be used as additions. On the other end of the scale, reverse osmosis can be employed to create a base water that is stripped of minerals such as iron, copper and zinc. Brewers will then add the desired minerals to create the kind of water they need for a particular beer style. So, next time you sit down with a beer in your hand, consider its source. The particular beer style was probably born centuries ago, through decades of development, in a town far away, from a water source that, at the time, had a completely unknown chemical makeup. But, combined with the local raw materials, it was probably the water that influenced what style was born there, and what is in your glass.